Nowadays, more people than ever are seeking quiet places, away from the bustling streets of the cities, where they can slow down, relax, and just enjoy their surroundings, their meal and drinks, and the company of their family and friends. These types of places are very popular in Budapest, with both locals and tourists, whether they are in groups or are looking for a place to escape from everybody and unwind by themselves. If you are searching for such a place too, here are a few you must visit while on one of many wonderful Eastern European tours. 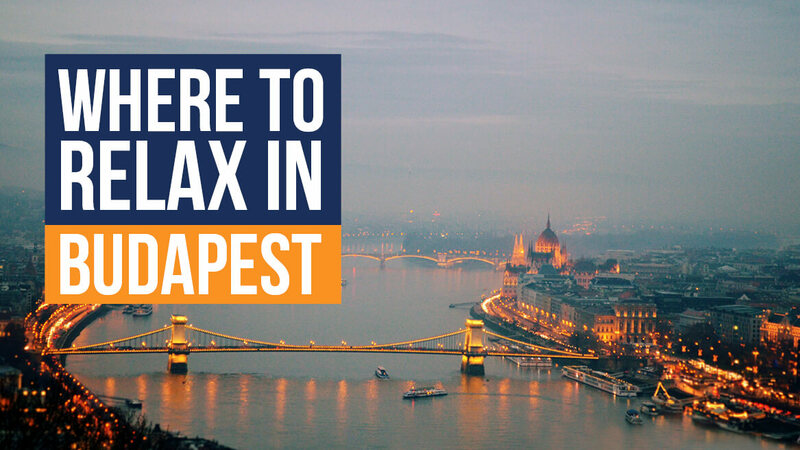 The Paris of East, the Pearl of the Danube, and the City of Spas are all nicknames for Budapest. Hundreds of thousands of travellers come to this city to enjoy numerous natural warm spring waters. Many thermal baths have existed here for centuries, especially the beloved Turkish baths, like the Kiraly Bath or Veli Bej Bath. We will mention only three, but by no means are these the only thermal baths, so make sure to visit as many as possible. Szechenyi Bath is one of the biggest natural hot spring baths in Europe, in addition to being one of the most popular in Budapest. Located in the City Park, it was built in the Neo-Baroque style. Since it was opened in 1913, millions have enjoyed its warm medicinal waters and exciting pools. This place has something for everybody. Its water is supplied by two thermal springs, while many medical studies indicate that the water may help alleviate numerous joint issues and illnesses. The Gellért Thermal Baths and Swimming Pool, known as the Gellért Baths is a bath complex within the famous Hotel Gellért, built between 1912 and 1918 in the Secession and Art Nouveau styles. The complex includes small pools with water from the mineral hot springs, saunas, plunge pools, an effervescent swimming pool, an outdoor swimming pool, a Finnish sauna, and masseuse services. The healing waters in this location were already talked about in the 13th century. A hospital was built on this site during the Middle Ages, and baths during the Ottoman Empire. The Ottomans called it the “magical healing spring”. It was also called the “muddy bath” due to the (mineral) silt that has settled at the bottom of the pools. Located on the Buda side of the Erzsébet Bridge, Rudas Baths is a thermal and medicinal bath built in 1550, during the Ottoman Empire rule. Many crucial elements of a Turkish bath were preserved, such as the Turkish dome and the octagonal pool. The bath has a sauna, a complex physiotherapeutic section, as well as a swimming pool and six therapy pools, such as the Juventus pool, immersion pool, rooftop pool, and two hot water pools. The temperature of water is 10-42°C, and it is excellent for joint illnesses and inflammations, vertebral disk problems, neuralgia, and calcium deficiency. The Museum Garden is the park constructed around the Hungarian National Museum. Concerts were being held in the Museum’s Ceremonial Hall since 1852 to help gather the money for the Garden Fund. Thanks to the collected funds, the gardener’s house was built that same year, and it still stands on the site. In 1953, a plan for the park was drawn, and the first trees were planted in 1855 in a celebratory atmosphere. The planting of the garden was completed two years later. This lovely place witnessed many social events, and it is one of the locals’ favourite places for daily relaxation. Just a couple of blocks from the National Museum, resting behind a fence, designed in French style, Károlyi-kert is one of the oldest deliberately created gardens in Budapest. In 1768 it became the property of the Károlyi family who lived in the adjacent Károlyi palace. However, due to financial issues in the 20th century, the family sold the palace and the garden. Fortunately, the state bought the property in 1929, and in 1932 reopened the garden as a public park. Now, it is a public garden famous for its gorgeous trees, plants, and flowers, for its dreamy paths, and its tranquil atmosphere. Located at the base of the prominent Rózsadomb neighborhood, the Gül Baba Street is a steep Mediterranean-style, cobblestoned path leading up to the octagonal, Turkish-style tomb of the 16th-century Ottoman holy man and dervish poet, Gül Baba, who died here in 1541. The mausoleum and the street are a tranquil, picturesque pilgrimage site for Muslims, while the site, with its pastoral ambience, is a beloved meeting spot for locals as well. The view from this place is awe-inspiring. Near the Gül Baba Street, rests a unique social area with a rustic ambience – another favourite spot for locals created by inspired architects and an imaginative property owner. In Margitutcakilenc, you can enjoy concerts, visit flea markets, eat delicious food, or simply relax in this family and animal friendly place.